Brethren assembled at Warrington Masonic Hall to see Paul Santus installed into the chair of King Solomon in Boteler Lodge No 7367. Paul Santus (left) and Derek Houghton before the ceremony. Derek Houghton, the installing master, opened the lodge in impeccable style, guided the lodge through routine business then took the time for heartfelt thanks to the members of the lodge for their support. He and the assembled brethren welcomed their principal guest for the evening, Provincial Junior Grand Warden Peter Allen, who was admitted with all due ceremony. In his company were grand officer Dennis Rudd, acting Provincial grand officer John James and Andy Barton (Warrington Group Chairman). Derek asked Ray Williams if he would occupy the chair of senior warden, Jim Carrington if he would occupy the chair of junior warden and Steve Clarke if he would act as inner guard for the installation. Each accepted with pleasure. 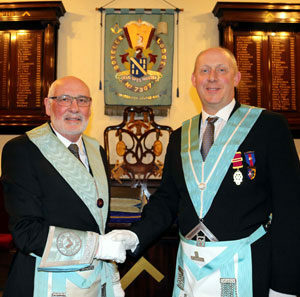 Paul Santus was then presented for installation by Brian Hoyle. The ceremony proceeded seamlessly. The third degree working tools were presented by Rod Wilson; the second degree working tools were presented by Barry Hodson and entered apprentice working tools were given by Dr Jake Rigby, (an EA initiated October 2017). All performed well. Addresses were given by Brian Hoyle to the WM, to the wardens by George Bennett, to the senior deacon by Paul Hankey, to the IG by Steve Clarke and to the brethren of the lodge by Peter Allen. The principal guest, Peter, was presented with charitable donations for the sum of £400 to the National Autistic Society (Warrington Branch), £400 to Ronald McDonald House (Alder Hey Hospital), £400 to St Rocco’s Hospice, £300 to the MCF 2021 Festival, £300 to West Lancs Masonic Charity and £200 to Warrington Masonic Hall, a grand total of £1,800. Peter made special mention of the amount of charity from the lodge and the wonderful work performed during the evening by the installing master, director of ceremonies and the explanations of the working tools. If this stunning charity donation was not enough, the collection in lodge raised £145 and a further £355 was raised by raffle at the social board, for the lodge charitable funds. A truly excellent effort. As is custom in this lodge, and in keeping with its reputation for excellent dining, the social board was a splendid affair starting with Thai chicken noodle soup (simply delicious), followed by fried whitebait, duck in honey, soy and ginger and trifle as desert. If this wasn’t enough, there was a premium cheese board and biscuits to follow. As an accompaniment were two delicious wines and port to go with the cheese. Not an evening on which to start the diet. 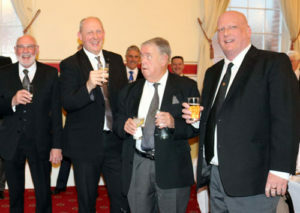 Paul Santus (left) toasted at the social board by Derek Houghton, Bill Hinchliffe and Paul Hankey. In a short speech, Peter congratulated Derek on his outstanding work in the lodge, the deliverers of the working tools and the director of ceremonies for his control of such good evening. After congratulating Paul Santus on his performance during the evening, and ‘taking to the role like a duck to orange sauce’, Derek Houghton gave a little of Paul’s history. He was born in Wigan, (although we shouldn’t hold that against him), his practical side led from school to an apprenticeship as a plumber. The next logical step from there was starting his own plumbing business, which has been successful ever since. Spare time in his youth was spent cycling, cross-country running and horse riding, but later life found him involved in amateur dramatics and singing in the local church choir, where he met Brian Hoyle, who introduced him into Masonry. Married to Millie, he has two sons Chris and Darren (now also a member the lodge). The master’s song was eloquently sung by Gwilym Jones, excellently accompanied by Brian Hoyle. The final word was left to Paul, who told how his friend Brian tricked him into Masonry, how proud he was that his son was now a member of Boteler Lodge and how he intended to be a fair ruler of the lodge. At evening’s end, bottles of Moet Champagne (in a pleasant change from flowers) were presented to Andy and Peter.